Check out this recipe for Candy Corn Baby Cakes Cupcakes! Heat oven to 350°F (325°F for dark or nonstick pans). Place mini paper baking cup in each of 48 miniature muffin cups. Make cake batter as directed on box for cupcakes, using water, oil and egg whites. Divide batter evenly among 3 medium bowls (about 1 1/2 cups in each). Stir orange food color into one bowl; stir yellow food color into second bowl. Leave remaining batter white. 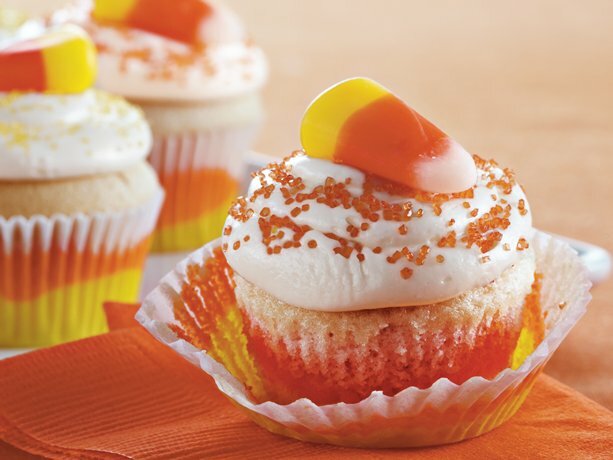 Place about 1 teaspoon of each color batter into each muffin cup, layering colors in order of candy corn—yellow, orange and white. Do not stir! Each muffin cup will be about three-fourths full. Bake 15 minutes or until toothpick inserted in center comes out clean. Cool 10 minutes. Remove cupcakes from pans to cooling racks; cool completely, about 20 minutes. Spread frosting on cupcakes. Sprinkle with coarse sugar; top with candy corn. Make quick work of filling the mini muffin cups by using a small cookie scoop or measuring teaspoon.